Who doesn’t love carrot cake? Especially when it is super moist and topped with luscious cream cheese icing. 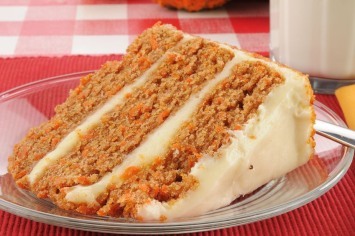 My best friend Linda from Ottawa, Ontario, Canada makes this cake and it really is the best carrot cake recipe around. Pour the cake batter into a greased tube pan OR 9″ x 13″ pan OR 2 loaf pans. You can also make 3 thin round cake layers (makes room for lots of cream cheese icing). Combine the dry ingredients (the first 5 in the list) in a bowl. In another bowl, mix the sugar, oil, eggs, carrots, and walnuts well. Add the flour mixture to the wet mixture and mix together well. Bake at 350ºF for about an hour. Stick in a fork or toothpick to check for doneness. Cream together the cream cheese, butter, and juice. Add the icing sugar gradually, until you have a nice, fairly thick icing consistency. If you make the cake in a tube pan, you’ll have enough icing for a 2-layer cake using half the recipe. If you make three layers you will need to make the whole batch of cream cheese icing. Linda says: This recipe won an award in my office Carrot Cake Contest. It’s the best carrot cake I’ve ever tasted — whether made in someone’s home, in a bakery, or in a restaurant. And it’s very easy to make! Have a look at another easy carrot cake recipe, this one a pineapple carrot cake.